SFTF or YOLO? Save money or enjoy life? The answer is found in LBYM! The need to save for the future combined with knowing you only live once creates a struggle. Do you save money or enjoy life? That’s pretty much the same as saying “it depends” and doesn’t really help when we’re caught in the struggle between saving for the future or living for the present. I believe the answer to this is found in another financial acronym… LBYM. LIVE= Spend your fun money because you only live once. BYM= Save for the future by living below your means. Here are the key points that will help you meet in the middle of both choices. Spend (wisely) on the things that bring you joy. When you deprive yourself of everything, it’s easy to become bitter. There’s gotta be some fun money, or else I believe we’ll end up with regrets. This is when the spenders and the savers need each other. The savers can learn from the spenders that it’s okay to exchange money for things that bring joy. 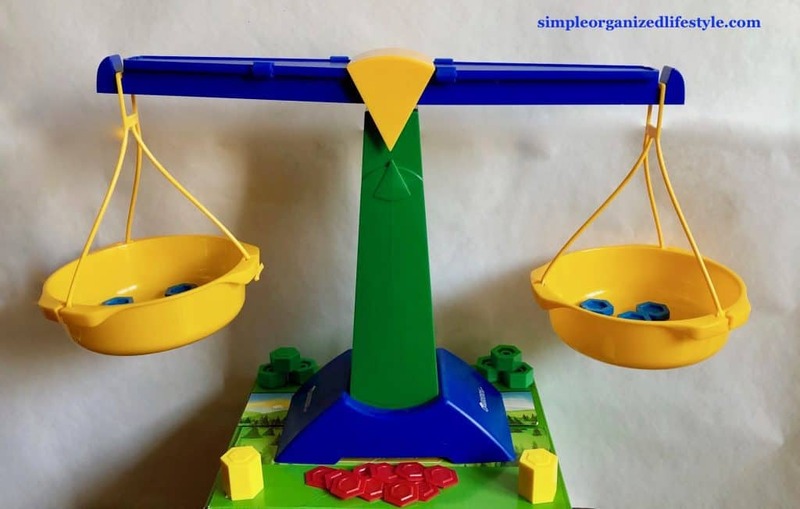 The spenders can learn from the savers how to make those choices with a little more self-control. I have a co-worker whose daily latte is the highlight of his day. That java brings him much joy. If you’re also a lover of lattes, then factor them into your budget and by all means, enjoy! Use a fun money filter. Deciding how to spend your fun money is a little easier with a simple funnel called the fun money filter. These are all things we want to do versus what really makes sense for our situation and the amount of money we have to spend. 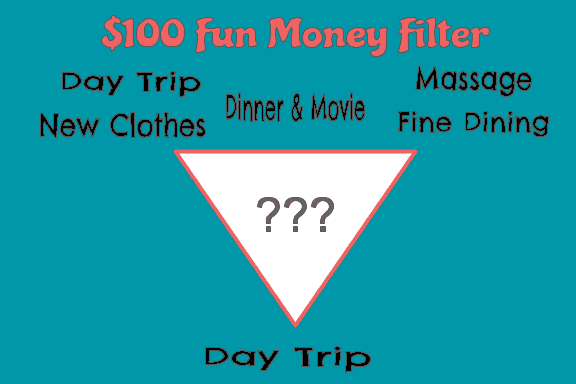 This is what my fun money filter would look like with $100 to spend on whatever I wanted. If I put these wants through the fun money filter, a day trip would win. The other choices are all fun, but we’re in the season of life with a young child and it makes the most sense. A day trip may consist of…. To me, that’s getting the most bang for my buck and our time. This helps make a decision without blowing your budget. Simply put, decide what is most important to you and let your money follow. I believe in a strong work ethic even if we don’t really like our jobs. However, I don’t believe in giving our work complete control of our lives. Now that I’m a little past the half-way point to retirement, I see this more than ever. The person whose work revolves around life or life revolves around work both will be replaced. You only live once doesn’t necessarily just mean the way we spend our money. It could mean that you’re a good employee, but you also spend time on your terms. Family first. I believe success is one day looking back at our working years and having no regrets about prioritizing our time with the people we care about most. And you know what, according to this study now turned into a best selling book, people at the end of their life would agree! Let’s consider what [below your means] looks like to save for the future and why it’s important. Saving for the future is a must because the future is not free. There will be a point when your income source is not there. “Live” is not even possible if “below your means” is not in place. Without it, it’s a constant struggle to just stay afloat. It’s okay to splurge on a fun experience, but this is after maxing out retirement plans. This is a way to live for today, but take care of your future self too. Imagine what a day in your non-working years might look like. They are called the “golden years” but will not be so golden if you are constantly worried about money. People are living longer and none of us want to run out of money before we run out of life! I know people who have very little retirement set aside and this is going to either require a drastic lifestyle change or extend their working years. Retirement plans buy you future time on your terms. How long can you ride out a sudden loss of income on your savings? One month? Three months? Six months? One year? The person who has enough savings to maintain their living expenses for six months to a year has “bought” peace of mind. I can’t think of a better place to put my money! Instead of viewing your savings as a thief of fun, think about it as goal to meet. Meeting that goal will buy less stress and more peace when it comes to finances. Imagine every spending choice as a weight on a scale. Can you enjoy a YOLO decision when the weight of debt is heavier? I don’t know about you, but the biggest financial mistakes I made with the least amount of planning came back to bite me. Take a little time to consider your YOLO decisions so that they don’t tip the scale. Comparison will steal both joy from living in the present and security of saving for the future. Consider what will truly bring you joy without comparing it to someone else’s ideal of joy. A $30,000 car might bring your neighbor more joy than it does you. If you’re happy driving a $15,000 car, a more expensive one is not going to bring you more happiness. In fact, it could do the total opposite with more debt and higher payments. Worried about what others will think if you’re not keeping up with the latest gizmos and gadgets? Let it go and free your mind… they don’t really care that much, and if they do, it’s their problem. Besides, if you have too much house and a brand new car, chances are you won’t even have any money left to spend as you please! Next year, my family is going to Disney World. We went when my son was 4 and are going again when he is 7. We’ve had three years to save up for another trip and won’t think twice about spending it in a few months. Our retirement accounts were not touched, our savings is automated and we can enjoy the trip without any kind of financial stress. Save for the future. Live beneath your means. But by all means, spend on the things that bring you the most joy because you do indeed only live once! Good advice Misty. For myself I would err on the side of YOLO 🙂 But it’s all perspective and circumstances. I have a job with a full lifetime pension. So, I’m outta here at 55 (which is the absolute earliest they will pay me) Because although you don’t want to run out of money. You only have so much time. Agree, I just don’t want to YOLO so much now that there’s none left when I have more time for YOLO later :] Like you, I will leave as soon as I can too and there really is no price you can put on time… can’t get it back and it is so valuable. I didn’t write this in the article, but I took a pay cut not long ago that gave me back more time and I do not regret it. Thanks for commenting!